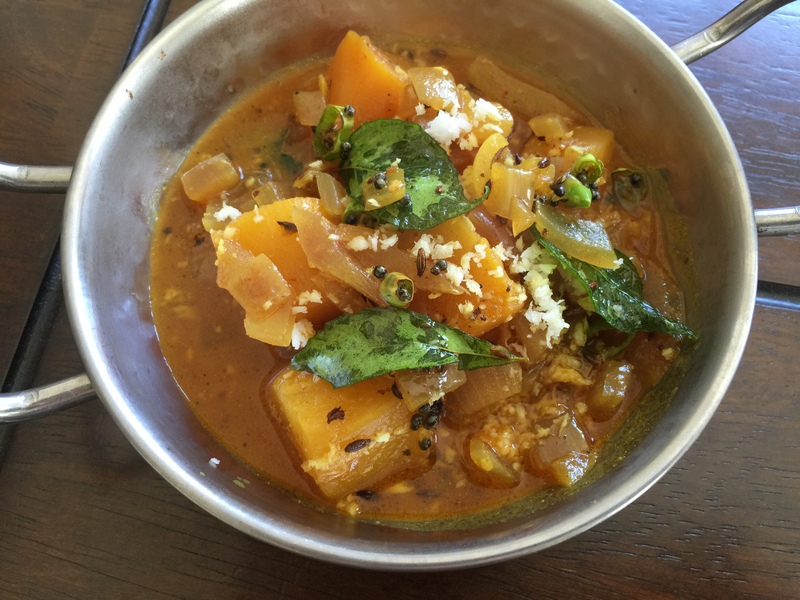 My husband Tejas, who doesn’t really like winter squash, loved this simple butternut squash curry. It’s even simpler if you grab the pre-cut package of squash from Trader Joe’s. I made enough for 2, but you could always double the recipe. Inspired by this pumpkin masala recipe from Swasthi’s Recipes. Heat oil in a saute pan and add the onions. Cook until he onions are translucent, adding the ginger part way through cooking. Add the turmeric, chili powder, amchur and Kitchen King. Add the squash and water and cook until the squash is tender. Add the coconut and salt. In a tadka or other small pan, heat the rest of the oil and add the mustard seeds and cumin seeds. Once the mustard seeds start to pop add the green chilis and cook for a few seconds. Then add the curry leaves and throw into the curry.